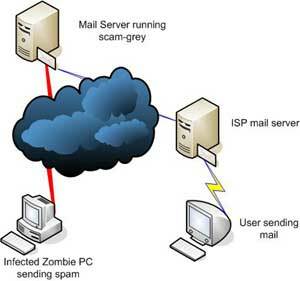 Scam-grey is a milter which filters mail originating from infected zombie PCs. It provides you the ability to mitigate the flow of spam from these computers using greylisting. Scam-grey milter was designed to be light-weight. It can be used on a mail server with a slow CPU and 128 MB of memory. On the first delivery attempt from a PC running Windows, Scam-grey generates a temporary error message. Subsequent delivery attempts made after the delay period will be allowed through. Unlike standard mail servers, virus, trojan infected hosts and zombies are not designed to retry the delivery after a temporary failure. as a record and returns a temporary failure (SMTP code 450 extended code 4.7.1) if the host is greylisted. The default greylisting delay is eight minutes. The record is expired if there is no connection for the matching record within the next 24 hours. Click here to see a sample of mail servers which are currently greylisted. Scam-grey has a configurable whitelist of IP addresses or a range of IP addresses (CIDR). This feature can be used to accept mail from known MS Windows sending servers without any delay. Hosts with a second level reverse DNS (www.example.com) are not greylisted. Users should configure their mail clients (MS Outlook, Eudora, Mozilla Thunderbird) to use the port 587 (MSA) instead of the SMTP port to send mail through the mail server running Scam-grey. Scam-grey measures the number of hops between the mail server and the computer sending the email. This feature can be used to accept the mail immediately if it falls within five hops. Scam-grey will accept mail if the connection was authenticated through SMTP AUTH. Please read the INSTALL and README files for more information. have been built with MILTER support enabled. using it to start p0f. site requirements. Review your maillog file regularly and whitelist valid Windows-based mail servers by adding an entry in the /etc/mail/scam.conf file. The following syntax is valid when adding entries to bypass greylisting. to make the expression case insensitive and e to use extended regex. You can also greylist hosts based on the helo string. This is the number of hops detected between the remote host and your mail server. A remote host is greylisted for 500 seconds. The greylist entries expire after a day. Start Scam-grey with the -R switch. If Scam-grey is started with the -t switch, the connection will not be greylisted. A X-Scam-grey: positive header will be inserted to the message instead. by ASN. You can perform an IP to ASN lookup at http://asn.cymru.com. If you are running scam-grey on a high volume mail server, please notify Team Cymru of the amount of queries that may be performed daily. It is common to use blacklists (DNSBL) for blocking connections. Some backlists may be too aggressive or may cause false positives. You can minimize the impact of these DNSBLs by using them to greylist hosts. where bl.example.org is the zone. You can define several DNSBLs by adding a line for each of them. Copyright © 2004-2010 Eland Systems All Rights Reserved. Redistribution and use in source and binary forms must retain the above copyright notice, this list of conditions and the following disclaimer. The name of Eland Systems may not be used to endorse or promote products derived from this software without specific prior written permission. The download is provided free of charge subject to our license agreement. Please send your comments and bug reports to scam+grey@elandsys.com. We would like to thank Team Cymru for providing an IP to ASN Lookup service. Mail sent from the following IP addresses are currently greylisted.